Welcome to the weekly Five Minute Friday writing link-up! If you’re new to this online writing community, you can learn more about us and how the link-up works by clicking here. Also, be sure to join our private Facebook group for ongoing encouragement and resources during the week! Join the @5minutefriday writing community as we write on the prompt, ANNIVERSARY! It’s been four years since I took over hosting this fabulous little writing community called Five Minute Friday. Four years, and every week I love it even more. What a privilege to be able to swing the doors wide open week after week to let others shine. You’re the ones who make it all worthwhile. The way you show up time and again with your courage and your creativity. You write hard and fast and free, and maybe without even realizing it, you reflect your Creator. You encourage and bless, you challenge and share. You give more than you receive. Here’s to another four years and then some, as we learn and grow and stretch beyond our limits together, depending all the while on the Author of it all, the One who gives words and thoughts and life within. Here’s to tenacity and faithfulness and using our gifts to the best of our ability, to showing up even when we’re tired, to giving kindness generously and without hesitation, to praying for God to use our efforts for His glory. Keep on keeping on, writer friend. Your words matter. You matter. Looking for some writing motivation? Try Five Minute Friday! To celebrate the fourth anniversary of my hosting this amazing writing community, I’m opening up the cart on these fun Five Minute Friday products! Grab yours before August 12th! Delivery will be made 10-14 days after the sale ends. Happy shopping! 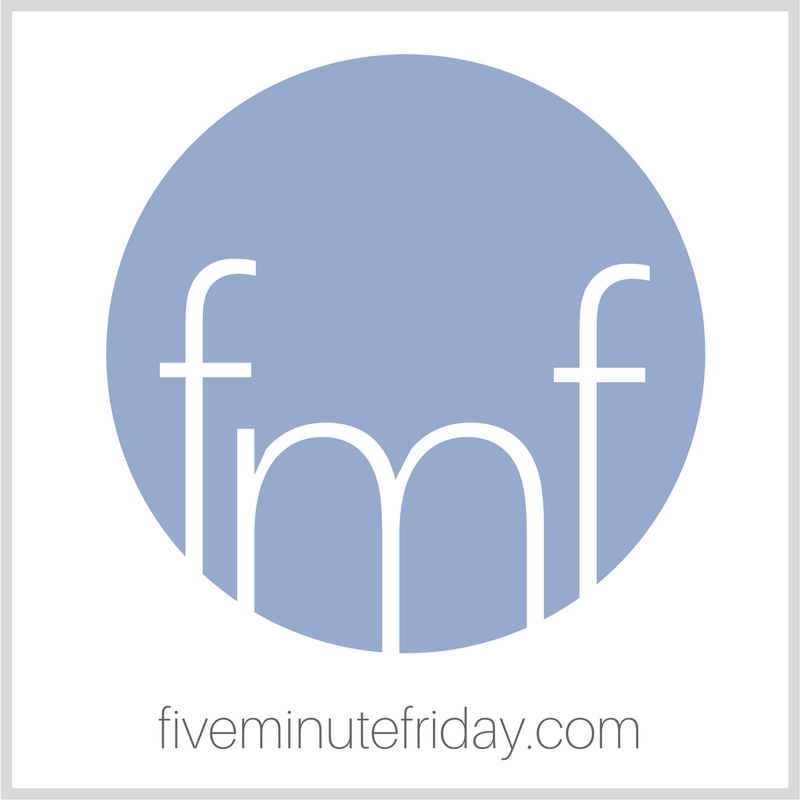 Check out these Five Minute Friday shirts and mugs! On sale through August 12. Join the link-up by adding your own five minute free write below! Then be sure to visit your link-up neighbor to read their post and leave an encouraging comment. Aww! Happy Anniversary and thank you for opening those doors week after week! Happy anniversary, Kate! Thanks for providing this writing space every week! Happy FMF Anniversary! And thanks for all you do in hosting this community! It’s almost three years since I joined you now and it has been such a blessing! Well, it’s this fun! I just wrote a post this morning (in about five minutes, give or take) about my 16th wedding anniversary! Thanks for continuing to host this fun space on the internet, Kate! Happy anniversary, dear Kate. Thank you for encouraging and inspiring us. Happy Anniversary Kate and Five Minute Community, thankyou for your encouragement. I think I’d be lost without you all. As his crimson washes over I stand free, I stand here clean.. we have a good good God.